The all-time favourite dish and the most searched for recipe on this site. 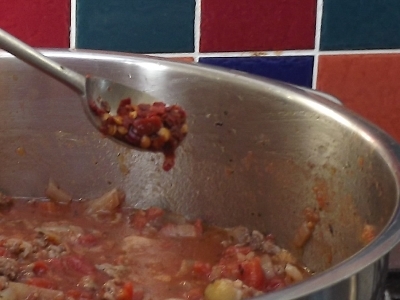 This is not a true bolognese sauce, but a variation that is used anywhere north of Italy. I tend to prepare huge amounts and freeze what I don't eat. I've carefully measured the ingredients and played around with different amounts and found the recipe below to be the best - but please feel free to modify! 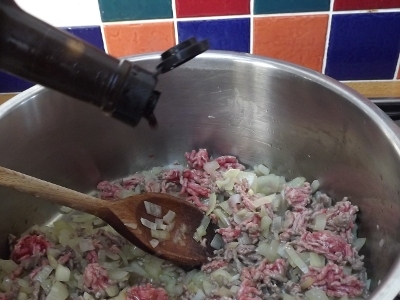 This will give you a not too salty bolognese with a very slight sharpness to it - my kids eat it as well. If you like your food hot, add more of the chili paste. Also, some people like more garlic in their sauce, so feel free to add more. 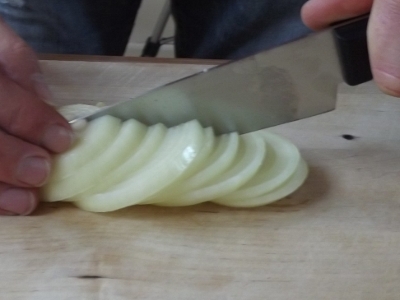 Peel and chop the onions. 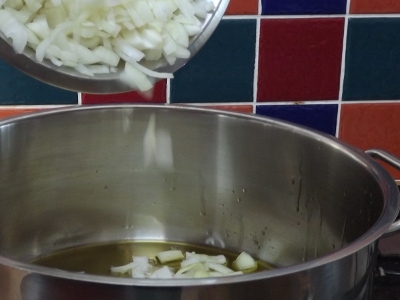 Pour the olive oil into a sizeable saucepan, heat it and fry the onions until translucent. 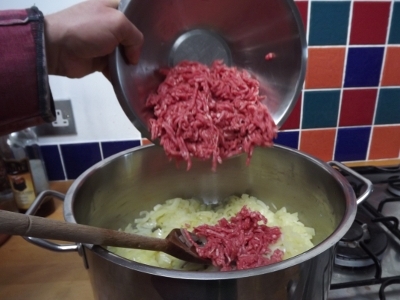 Add the mince and fry until the mince is brown and crumbly. 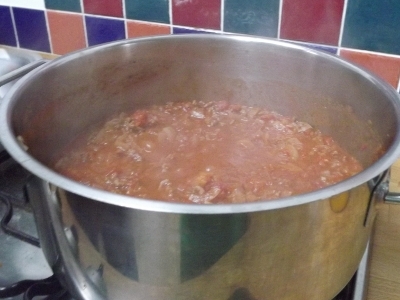 Now add the wine, worcester sauce, spices, tomatoes, squeezed garlic, chili paste, honey and tomato concentrate. Simmer for at least 45 minutes, or, if you have the time, for 2 hours. Bring the water to a boil. Add the olive oil and salt, then the spaghetti. I normally use a timer to keep track of the cooking time (check the pasta package) - it tends to be between 9 and 12 minutes depending on the variety. Check at the lower end of the cooking time to see if they are "al dente" - meaning they still have a bit of a bite. 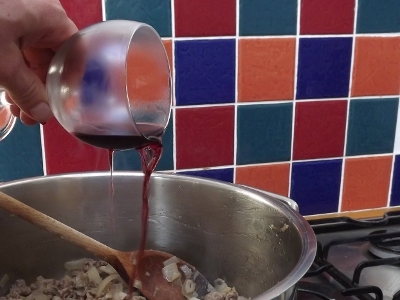 Now put out the whole lot into a colander which you have placed in your sink. 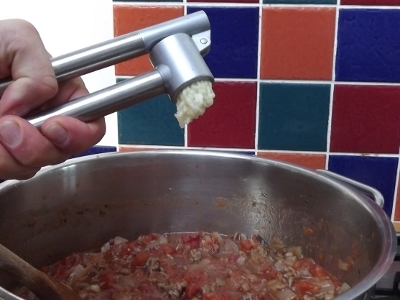 Turn on the cold water and rinse the spaghetti under the water (whilst they are still in the colander). 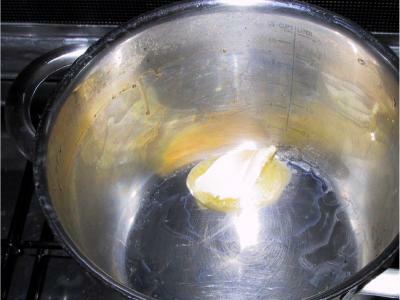 Put the saucepan back onto the hob and add the butter. 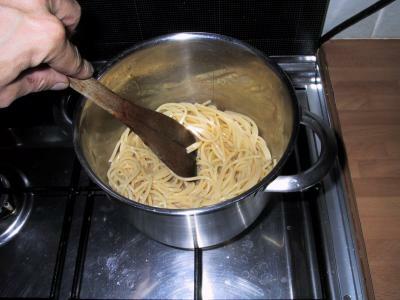 Melt the butter, then put the spaghetti back into the saucepan and heat them up whilst turning them. The pasta will taste great, not stick together and be just right. You can also re-heat it if someone appears late for dinner. 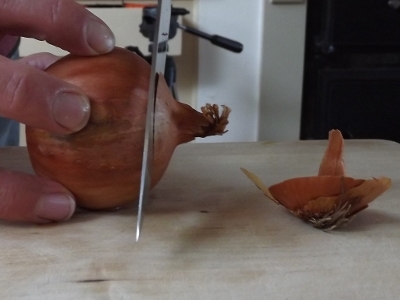 Take the top and bottom off the onions. 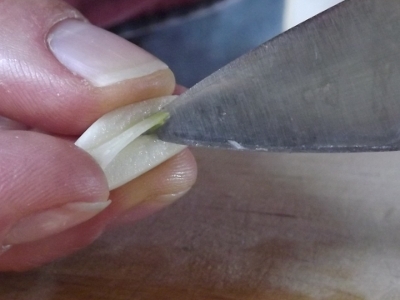 If your garlic has any green bits inside, take them out - prevents bad breath and indigestion. 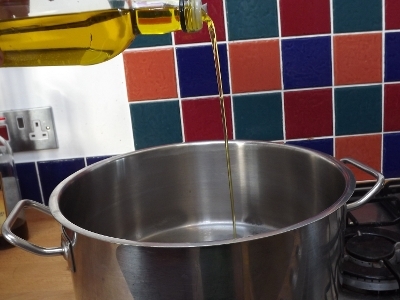 Put the olive oil into a sizeable saucepan. 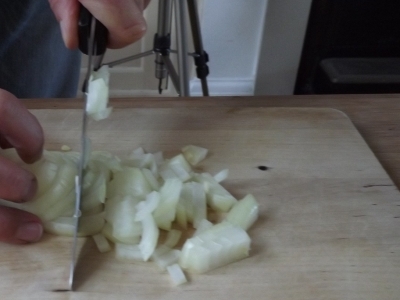 Now add the chopped onions. These are the dried spices to be added later. A nice splash of Worcester Sauce won't hurt. 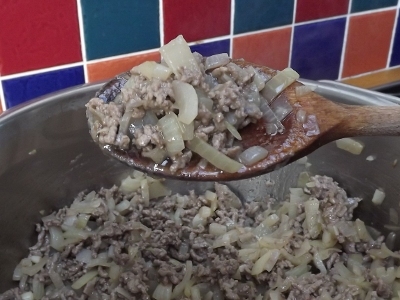 Fry the mince and the onions until the mince is nice and crumbly - we want to get rid of most of the excess moisture. Now add the glass of red wine. 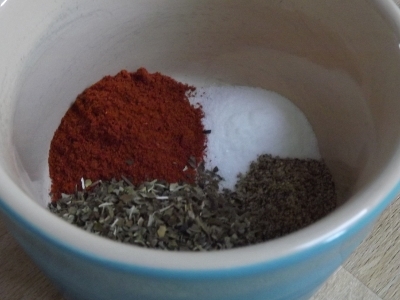 These are the dried spices (salt, pepper, paprika, oregano). 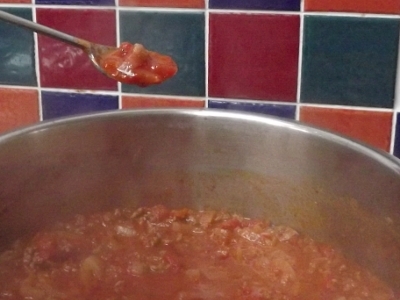 Add the tinned chopped tomatoes. 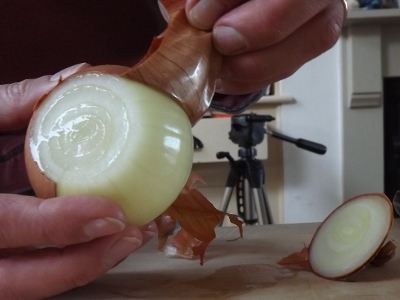 Press the garlic cloves into the sauce. 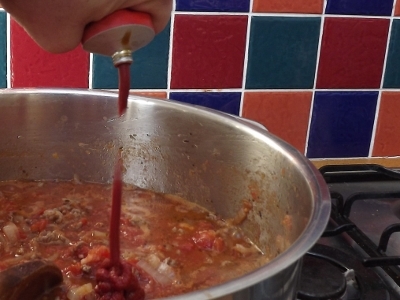 ... and the tomato concentrate. 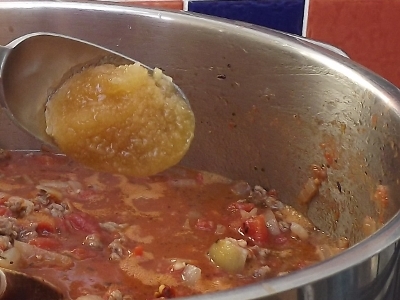 Let it simmer on low heat for a minimum of 45 minutes - stirring occasionally so it won't burn. 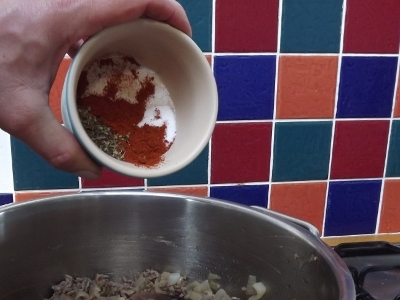 This is to reduce the sauce so it will be nice and thick and blend together. I normally simmer the sauce for two hours. Bring the water to a boil, add salt and olive oil. 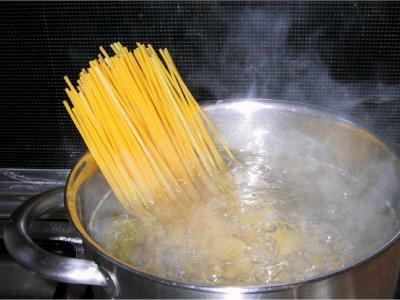 Put the spaghetti into the boiling water. 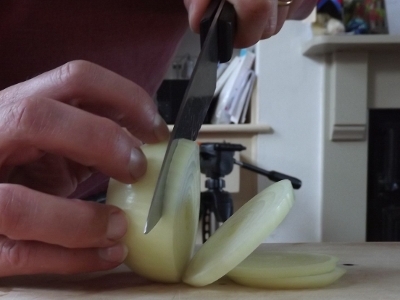 You can bend them around the saucepan once they have been in the boiling water for a couple of seconds. These photos show a single portion of spaghetti. 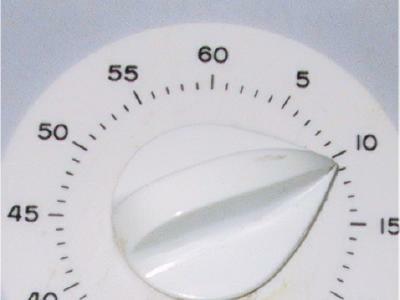 Nothing wrong with using a timer - taste the spaghetti after the recommended cooking time is over. They should be "al dente". 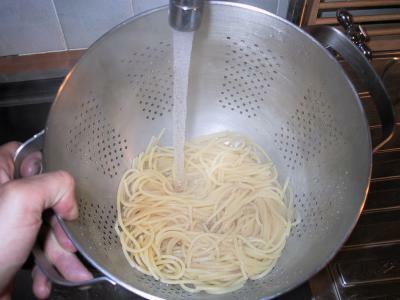 When the spaghetti are to your liking, pour them into a colander and rinse them under cold water - yes, you want the pasta to actually cool down. 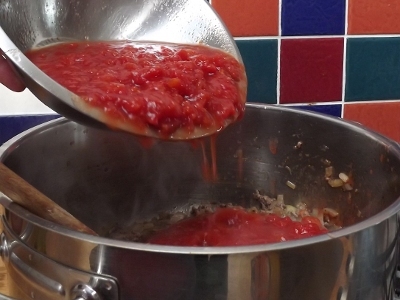 ... and put the well-drained spaghetti back into the saucepan. 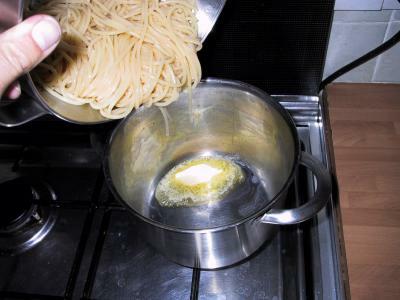 Now stir whilst re-heating the pasta in the melted butter until they are hot. 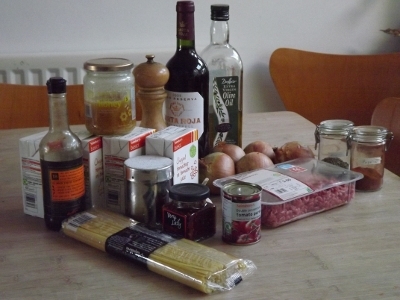 Presto - your spaghetti bolognese! This is my favourite dish of all times. Serve with grated Reggiano and some chopped basil. 8 Top drawer mate!! Nice and easy!! 8 Looks like a really good meat sauce, but please don't call it a bolognese sauce, which it does not resemble in any way. 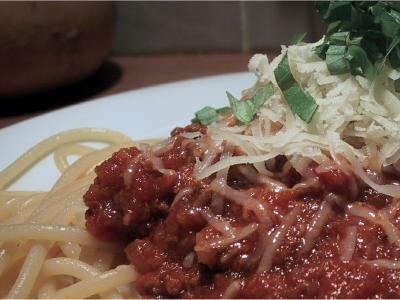 10 Pats geriausias Spaghetti Bolognese receptas, tiesiog tobulas !!! 10 Brilliant. So flavoursome, unbelievably moreish. 10 Really tasty, beautiful flavours. I add a couple of bay leaves to mine and some fresh tomatoes/passata but that's it. perfecto! 9 Very nice maybe next time i will put mushrooms or/and smoked bacon. 10 This is brilliant. Thanks for the practical, easy to follow steps. 10 Easy and tasty!! Had been using this recipe for the past 8 years! 10 Best ever tasted! It's soo indifferent from the other stuff and it's made from scratch. Love it! 10 Fanx. Shall try this tonight. 10 brilliant , my son wants to learn how to cook , but being special needs has trouble reading , excellent keep up the good work. 10 Brilliant recipe - have made many times always with compliments! 10 The best spaghetti bolengese ever!! 10 This is the best set out recipe I've ever come across. Well done & many thanks from a novice... Tastes great too! 10 10 i gave it a perfect rate because it is very detailed.,oh how to prepare ,good and great. 10 Wonderful, ur recipe are straight. 10 Wonderful illustration of the recipe, thank you. 10 very good advice thankz.